MARSHALL, John, (uncle of Thomas Francis Marshall; cousin of Humphrey Marshall [1760–1841]; relative of Manley Caldwell Butler), a Representative from Virginia; born in Germantown, Fauquier County, Va., September 24, 1755; received instruction from a tutor and attended the classical academy of the Messrs. Campbell in Westmoreland County, Va.; at the outbreak of the Revolutionary War joined a company of State militia that subsequently became part of the Eleventh Regiment of Virginia Troops; studied law at the College of William and Mary, Williamsburg, Va.; was admitted to the bar on August 28, 1780; resigned his Army commission in 1781 and engaged in the practice of law in Fauquier County; delegate in the Virginia house of delegates in 1780; settled in Richmond and practiced law; member of the executive council 1782-1795; again a member of the house of burgesses 1782-1788; delegate to the State constitutional convention for the ratification of the Federal Constitution that met in Richmond June 2, 1788; one of the special commissioners to France in 1797 and 1798 to demand redress and reparation for hostile actions of that country; resumed the practice of law in Virginia; declined the appointment of Associate Justice of the Supreme Court of the United States tendered by President Adams September 26, 1798; elected as a Federalist to the Sixth Congress and served from March 4, 1799, to June 7, 1800, when he resigned; was appointed Secretary of War by President Adams May 7, 1800, but the appointment was not considered, and on May 12, 1800, was appointed Secretary of State; entered upon his new duties June 6, 1800, and although appointed Chief Justice of the United States January 20, 1801, and notwithstanding he took the oath of office as Chief Justice February 4, 1801, continued to serve in the Cabinet until March 4, 1801; member of the Virginia convention of 1829; continued as Chief Justice until his death in Philadelphia, Pa., July 6, 1835; interment in the Shockoe Hill Cemetery, Richmond, Va.
Papers: 1803-1831. 1 volume. Drafts of opinions delivered in U.S. Circuit Court. Papers: 1797-1831. 282 items. Family correspondence, poetry, and other papers. Papers: 1809, 1827. 2 letters. Photostats of official correspondence. Finding aid in repository. Papers: Draft of an official letter (February 4, 1825) in the DeWitt Clinton collection. Finding aid in repository. Papers: 3 official letters (July 23, 1800-June 7, 1814) in the John Jay collection. Finding aid in repository. Papers: 1 official letter (December 12, 1809) in the Gouverneur Morris collection. Finding aid in repository. Papers: 1776-1835. 8 containers. Largely photocopies and transcripts. Unpublished finding aid in repository. Papers: Letters (photocopies) in the Edward C. Walthall papers, 1816-1894. 50 items. Papers: 1827 (?). 16 page autobiographical sketch. Papers: 4 letters in Louis Marshall papers, 1816-1834. 5 items. Papers: 1789-1835. ca. 50 items in Marshall and other papers. Personal and legal papers and correspondence, photographs of oil paintings, and engravings. Many letters have political content. Finding aids to many of the collections. Papers: 1783-1835. 25 items. Personal and business papers and correspondence, including some copies of material privately owned and some undated. Finding aid in repository. Baker, Leonard. John Marshall: A Life in Law. New York: Collier Books; 1974. Reprint, London : Collier Macmillan Publishers, 1981. Beveridge, Albert J. John Marshall. Introduction by Henry Steele Commager. 1916-1919. Reprint, New York: Chelsea House, 1980. ------. The Life of John Marshall. Boston: Houghton Mifflin, 1916-1919. Reprint, Atlanta, Ga.: Cherokee Pub. Co., 1990. Brown, Richard Carl. John Marshall. Morristown, N.J.: Silver Burdett Co., . Corwin, Edward Samuel. John Marshall and the Constitution: A Chronicle of the Supreme Court. New Haven: Yale University Press, 1919. Reprint, Toronto: Glasgow, Brook; New York: U.S. Publishers Association, 1977. Craigmyle, Thomas Shaw, Baron. John Marshall in Diplomacy and in Law. New York: C. Scribner's Sons, 1933. Reprint, with an introduction by Nicholas Murray Butler. Buffalo, N.Y.: W.S. Hein & Co., 1995. Cuneo, John R. John Marshall, Judicial Statesman. New York: McGraw-Hill, . Faulkner, Robert K. The Jurisprudence of John Marshall. 1968. Reprint, Westport, Conn.: Greenwood Press, 1980. Feinberg, Barbara Silberdick. John Marshall: The Great Chief Justice. Springfield, N.J.: Enslow Publishers, 1995. Gunther, Gerald, comp. John Marshall's Defense of McCulloch v. Maryland. Edited and with an introduction. by Gerald Gunther. Stanford, Calif.: Stanford University Press, 1969. Haskins, George Lee. Foundations of Power: John Marshall, 1801-15. Part one by George Lee Haskins; part two by Herbert A. Johnson. New York : Macmillan Pub. Co., 1981. Hobson, Charles F. The Great Chief Justice: John Marshall and the Rule of Law. Lawrence: University Press of Kansas, 1996. Johnson, Herbert Alan. The Chief Justiceship of John Marshall, 1801-1835. Columbia, S.C.: University of South Carolina Press, 1997. Jones, William Melville, ed. Chief Justice John Marshall; A Reappraisal. Ithaca, N.Y.: Published for College of William and Mary [by] Cornell University Press, . Reprint, New York: Da Capo Press, 1971. Kallen, Stuart A. John Marshall . Edina, Minn.: ABDO Pub., 2001. Loth, David Goldsmith. Chief Justice: John Marshall and the Growth of the Republic. New York: W. W. Norton, . Reprint, New York: Greenwood Press, [1970?]. Magruder, Allan B. (Allan Bowie). John Marshall. Boston: Houghton Mifflin, 1898. Reprint, New York: AMS Press, . Marshall, John. An Autobiograpical Sketch. Edited by John Stokes Adams. 1937. Reprint, New York: Da Capo Press, 1973. ------. The Constitutional Decisions of John Marshall. New York: G.P. Putnam's Sons, 1905. Reprint, Edited, with an introductory essay by Joseph P. Cotton, Jr. Union, N.J.: Lawbook Exchange, 2000. ------. George Washington. 1832. Reprint, New York: Chelsea House, 1981. ------. A history of the colonies planted by the English on the continent of North America, from their settlement to the commencement of that war which terminated in their independence. Philadelphia: A. Small, 1824. ------. John Marshall, complete constitutional decisions. Chicago: Callaghan & Company, 1903. ------. John Marshall, "A Friend of the Constitution": In defense and elaboration of McCulloch v. Maryland. Introduction: Unearthing John Marshall's major out-of-court constitutional commentary. By Gerald Gunther. [Stanford, Calif.: N.p., 1969]. ------. John Marshall, Complete Constitutional Decisions. Edited with annotations historical, critical, and legal by John M. Dillon. Chicago: Callaghan & Co., 1903. Reprint, Buffalo, N.Y.: W.S. Hein, 2003. ------. The Life of George Washington. Philadelphia: Printed and published by C. P. Wayne, 1805-07. Reprint, Edited by Robert Faulkner and Paul Carrese. Indianapolis: Liberty Fund, 2000. ------. Major Opinions and Other Writings. Edited with an introduction and commentary by John P. Roche, with Stanley B. Bernstein. Indianapolis: Bobbs-Merrill, . ------. Opinions of the late Chief Justice of the United States (John Marshall) concerning freemasonry. [Boston? : N.p., 1840]. ------. The Papers of John Marshall. Edited by Herbert T. Johnson, Charles T. Cullen, Charles F. Hobson, and Nancy G. Harris. 7 vols. Chapel Hill: University of North Carolina Press, 1974. ------. The Political and Economic Doctrines of John Marshall, Who for Thirty-four years was Chief Justice of the United States. And also his letters, speeches, and hitherto unpublished and uncollected writings, by John Edward Oster. New York: The Neale Publishing Company, 1914. Reprint, New York: B. Franklin, . ------. Speech of the Hon. John Marshall, delivered in the House of Representatives of the United States, on the Resolutions of the Hon. Edward Livingston, relative to Thomas Nash, alias Jonathan Robbins. Philadelphia: Printed at the office of "The True American," 1800. ------. The Writings of John Marshall, Late Chief Justice of the United States, Upon the Federal Constitution. Boston: James Munroe and Company, 1839. Reprint, Littleton, Colo.: F.B. Rothman, 1987. Martini, Teri. John Marshall. Illustrated by Alex Stein. Philadelphia: Westminster Press, . Newmyer, R. Kent. The Supreme Court under Marshall and Taney. New York: Crowell, 1968. Reprint, Arlington Heights, Ill.: Harlan Davidson, . Richards, Gale L. "A Criticism of the Public Speaking of John Marshall Prior to 1801." Ph.D. diss., University of Iowa, 1951. Robarge, David Scott. 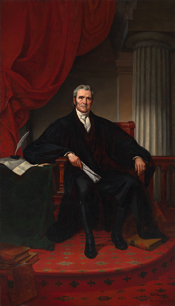 A Chief Justice's Progress: John Marshall from Revolutionary Virginia to the Supreme Court. Westport, Conn.: Greenwood Press, 2000. Rudko, Frances Howell. John Marshall and International Law: Statesman and Chief Justice. New York: Greenwood Press, 1991. Shevory, Thomas C. John Marshall's Law: Interpretation, Ideology, and Interest. Westport, Conn.: Greenwood Press, 1994. Siegel, Adrienne. The Marshall Court, 1801-1835. Millwood, N.Y.: Associated Faculty Press, 1987. Smith, Jean Edward. John Marshall: Definer of a Nation. New York: H. Holt & Co., 1996. Stites, Francis N. John Marshall, Defender of the Constitution. Edited by Oscar Handlin. Boston: Little, Brown, 1981. Turner, Kathryn. "The Appointment of Chief Justice Marshall." William and Mary Quarterly 3 ser. 17 (April 1960): 143-63. Wetterer, Charles M., and Margaret Wetterer Chief Justice. Illustrated by Kurt K.C. Walters. New York: Mondo Pub., 2005. White, G. Edward. The Marshall Court and Cultural Change, 1815-1835. With the aid of Gerald Gunther. New York: Macmillan Pub. Co., 1988. Reprint, New York: Oxford University Press, 1991. John Marshall, One of a Kind?